Blog Do You Trim Orchid Stems? If you have an orchid or two in your home, you may be wondering what to do with the flower spike once blooming is finished. You may be thinking it’s time to buy a new plant. Here’s the good news – with a little bit of care your phalaenopsis orchid is going to produce those lovely flowers again. Do you trim orchid stems? You should trim the stem of a phalaenopsis orchid after blooming has finished. Trim your orchid just above the node on the stem directly below where the first flower bloomed. This will increase the chance of another cycle of blooming from the same flower spike. 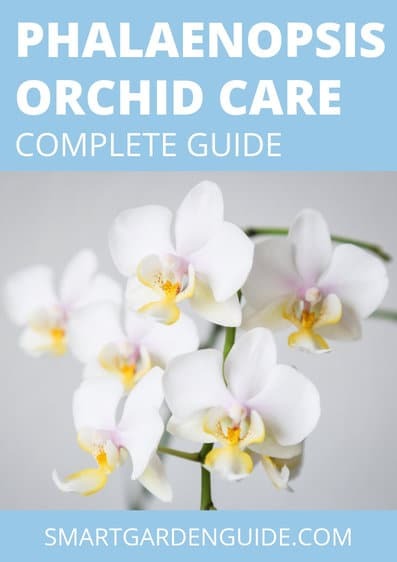 By following my advice here, you will increase the chance your orchid will produce those beautiful flowers once again, without having to wait for an entirely new flower spike to grow. I’m concentrating on phalaenopsis orchids in this article due to their overwhelming popularity. What’s The Difference Between An Orchid Stem And An Orchid Flower Spike? 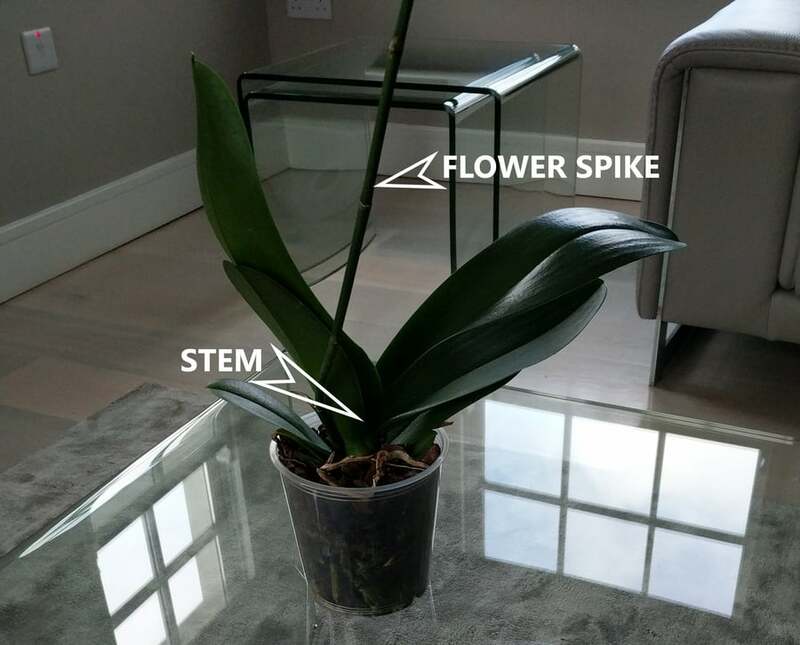 A lot of people use the term stem, when what they are really referring to is the flower spike. The long slender growth that rises from the vegetation of a phalaenopsis orchid and holds the buds and blooms is called the flower spike. The stem refers to the thick, green, vegetative origin of the leaves. However, I use the term stem and flower spike interchangeably in this article to refer to the flower spike. I do this as some people who care for phalaenopsis orchids at home may be unaware of the correct terminology. And besides, it doesn’t matter as long as we all know we’re referring to the same things. For trimming, you can use scissors, a sharp knife, or pruning scissors. When trimming your orchids, only use cutting tools that are clean and sterile. Otherwise you may spread bacteria, fungi, or viruses from one plant to the next. To sterilize your tools, clean them with rubbing alcohol or heat up the blade with a flame. Your other option is to use razor blades, one per plant, and then carefully dispose of the blade after you’ve trimmed one plant. This reduces the risk of infecting your orchids with disease and damaging or killing them. There’s just one last requirement – after trimming, treat the cut stems with an anti-fungal plant treatment. Or use cinnamon from your kitchen – it’s a natural fungicide. Just rub a little bit of the cinnamon right on the area that was cut. Be sure not to get any cinnamon on the leaves of the orchid otherwise it will pull moisture out of the leaf. What you do with the flower spike depends on how it looks after the blooms fall off. If it is green and healthy, it remains alive and capable of producing a secondary spike and more blooms. If it is brown and dry, it will not rebloom and it’s best to cut it right back. Here is the process to follow in each situation. On the stem, look for a node below the lowest flower bloom. Trim just one-inch above this node, making a clean cut. When you do this, there is about a 50% chance that a side shoot will start to grow off this node, which should then rebloom. The benefit of cutting a flower spike like this is that there is a reasonable chance of the plant producing more blooms much earlier than if you were to wait for a new flower spike to develop. However, it takes more energy for the orchid to bloom so soon again and the flowers may be smaller than they were previously. Sometimes it’s best to give your orchid a little rest from producing those gorgeous flowers. If your orchid is looking less healthy, I would advise cutting the flower spike off at the base. 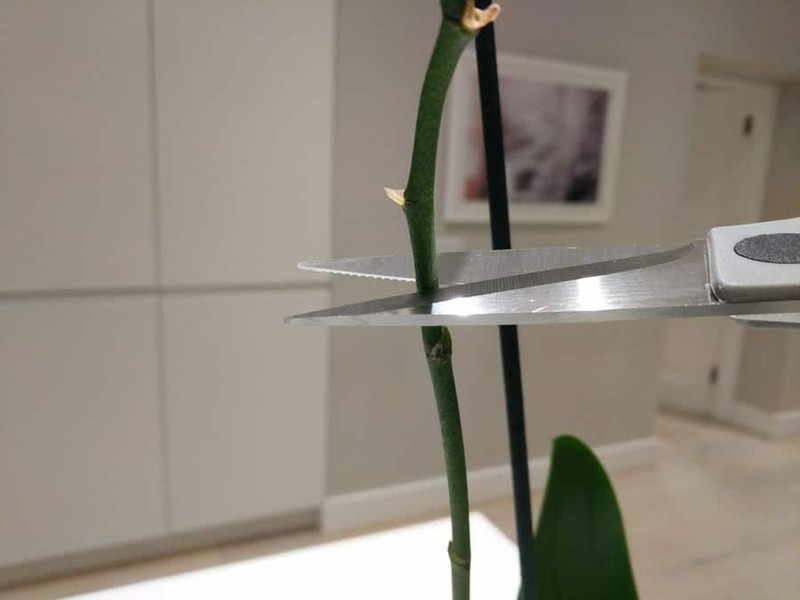 This will allow the orchid to focus on developing new roots and leaves and building up energy stores to grow a new flower spike in the next blooming season. If the stem is brown and unhealthy, there is no point in trimming the stem above a node. If the flower spike has turned brown, the orchid has decided that this flower spike is dead and no amount of care from you will change this. Cut the stem all the way down to the base of the plant. This is the best way to encourage the plant to focus on growing healthier roots and encourage a full bloom in the next year. The healthier the root system is, the happier your orchid is going to be. Sometimes, only the top section of the flower spike will have turned brown, while the lower section will remain green and vibrant. I have had good success with cutting the flower spike just above the highest healthy node, so feel free to try this. This can sometimes result in a side shoot growing that is quite low, but it can be gently staked as it grows to produce a more vertical display of blooms. If you’re fortunate, your phalaenopsis may have a double spike rather than a single. If you have one of these orchids, trim the stems this way: cut one stem above a node and the other stem at the base of the plant. The orchid will not have enough energy to rebloom from both flower spikes, but by focusing on one, you increase the chance of secondary blooms, without having to wait for a new flower spike to develop. Check out my video below to learn all about what do do with your phalaenopsis orchid spike after blooming is finished. You’ve Trimmed and Still No Blooms? It can be frustrating…you’ve trimmed the stem of your orchid and you’re still not getting any new blooms. What are you doing wrong? There are five main reasons your orchid may be refusing to bloom for you. Sometimes phalaenopsis orchids just won’t rebloom from the same flower spike no matter what you do. Just try to give it the best care possible and keep your fingers crossed. Some plants seem to produce secondary blooms easily while others will not. 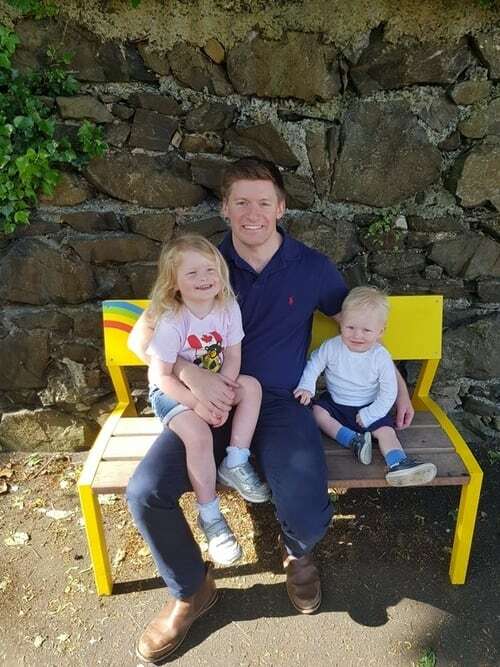 It’s not always got anything to do with the care you are providing. Orchids produce energy through photosynthesis, so if your orchid isn’t getting enough light, it won’t have sufficient energy to bloom again quickly. Orchids should ideally be no more than about 3-feet away from a window in order to thrive. Orchids do best with light from above, so being too far the window means an inadequate light supply. And without the right kind of light, your orchid won’t have enough energy to bloom and produce flowers. As well, any new growth on the plant will be small, with leaves that are less vibrant. Another reason your orchid may be refusing to bloom is that the plant isn’t being kept at the right temperature. Orchids are very fussy about the temperatures they live in. During the day, temperatures should range from 65 to 75 °F (16 to 24 °C). During the night, the temperature should be below 65 to 75 °F (16 to 24 °C), with a preference being about 60 °F (15 °C). The need for this fluctuation in temperature is to encourage the plant to produce buds and then flowers. Are you giving your orchid the right kind of water? Yes…orchids can sometimes be a little fussy. Water from your tap can sometimes be too hard, which can cause problems with nutrient absorption and toxicity. Orchids thrive wonderfully when you use distilled water or rainwater, so consider giving this a go if you are concerned about the quality of your tapwater. Check the root system of your orchid. If you’ve been over-watering, you may have been damaging the roots of the plant, causing some root rot. Unhealthy roots are also the result of potting mix that has broken down and no longer has the nutrients your orchid needs to thrive, grow, and bloom. 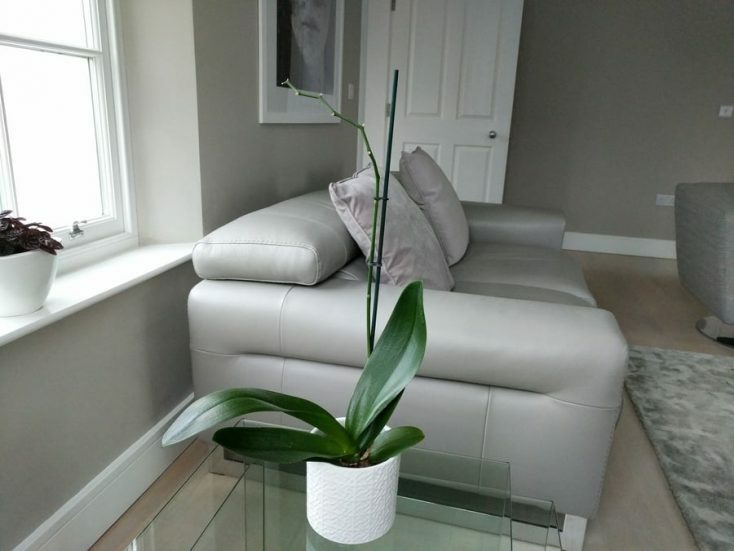 Consider repotting your orchid after trimming the stem, particularly if you’ve cut the stem back to the base. Why is this a good time? Your orchid is going to be focused on growing new leaves and roots as it enters the vegetative phase. Providing new potting media and maintaining the roots at this time can allow the orchid to grow to its full potential. Read my article about repotting phalaenopsis orchids to learn more. Whether you’re trimming the stem or not, orchid mix starts to break down within a year or two, depending on the media being used. An orchid bark mix is a good choice for repotting – this mix is specifically created for orchids to allow for proper drainage. You should be fertilizing your orchid every 1-2 weeks while not blooming, regardless of whether you’ve trimmed the flower spike or not. Use a balanced fertilizer that has all the basic nutrients the plant requires, such as a 10-10-10 fertilizer. Be sure the fertilizer is urea-free. One thing to remember when it comes to feeding your orchid – they do better with too little fertilizer rather than with too much. Many orchid growers recommend using half the recommended strength of fertilizer on a weekly basis, rather than a stronger application less frequently. You should generally only rebloom once from the same stem to avoid tiring out the orchid. Otherwise, you may see smaller flowers and signs of stress in the rest of the plant. Check the air circulation in the pot – the roots of your orchid need to have air gently circulating around them. You can achieve this by making sure you use a suitable potting medium such as pine bark. When your orchid is blooming, make sure the roots have a chance to dry out between watering. If the soil is too wet the flowers may drop before they are done blooming. Set your orchid in a room with good circulation – stale air can cause bacteria or fungal disease to grow on the flowers and leaves. Keep your orchid away from fruit that is ripening in your kitchen. Ripe fruit releases ethylene gas which may cause the flowers on your orchid to die and start dropping. Never mist your orchid. If there’s too much moisture on the flowers it can cause fungus and bacteria to grow. Maintain humidity levels at about 40-70%. Low humidity can cause bud drop, leaf dehydration and brown leaf tips. Excessive humidity increases the risk of bacterial and fungal disease. How long will it take for my orchid to flower again? After you’ve trimmed the stem on your orchid, the plant may start to bloom again from the same flower spike in about 8 to 12 weeks, but it could take as long as a year or more. However, orchids do not always bloom again from the same flower spike. In fact, if they typically only rebloom from the same spike about 50% of the time. Read my article about reblooming phalaenopsis orchids here. Is there anything else I can do to stimulate reblooming? After trimming, to encourage your orchid to bloom again, you can expose the plant to cooler nighttime temperatures. Avoid placing the plant in an area where there are cold bursts of air. The buds on my orchid are turning yellow and falling off…should I trim the stem? The term for this is “bud blast”, a sign that your orchid is unhappy. Some of the causes include inadequate light conditions, insufficient humidity, too much or too little water, or too much fertilizer. This is a good time to trim the stem, repot, and fertilize. What Is Deep Water Culture Hydroponics?